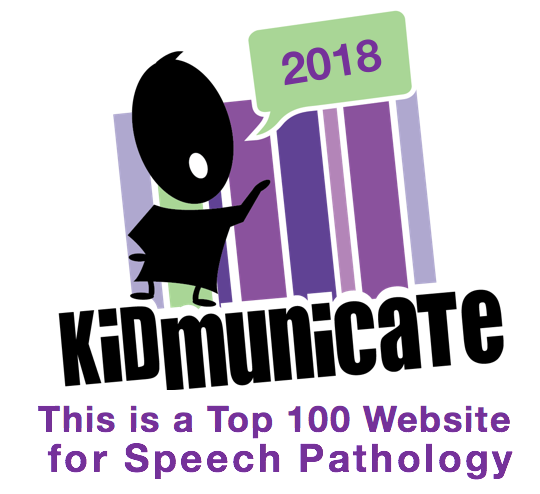 SpeechTechie- Technology, Apps and Lessons for SLPs and Teachers who like Words: Announcing Go-Togethers! Developing students' semantic abilities is one of my favorite parts of my job! I think words, and the connections between them, are just really fun! Building semantic networks provides students with a stronger vocabulary base, which in turn gives them points of reference as they learn new words. Enter Go-Togethers, an app I helped design along with Rosie Simms for Smarty Ears Apps. 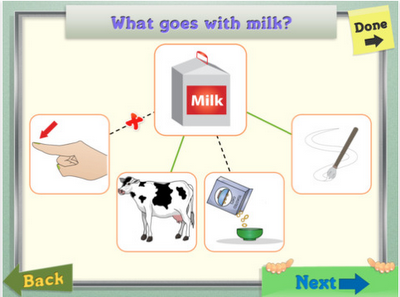 Go-Togethers targets identification of word associations as well as expressive naming. When designing the interface for this app, we wanted to utilize more innovative responses in terms of gestures that take advantage of the iPad, iPod Touch, and iPhone's touch screen. For this reason (although a simple tap will also work for students with fine motor difficulties), receptive connections are made by a tap-and-drag, essentially creating a semantic word map for each target. 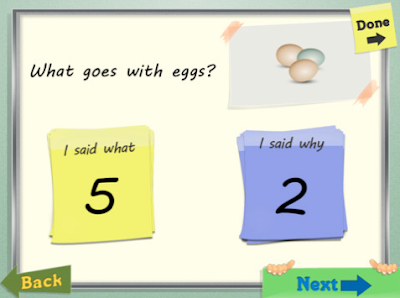 Likewise, the expressive level allows you (or the student) to tap-and-tally both associated items (e.g. "a cake!" and, optionally, rationales "because eggs are needed to make a cake!") for an open-ended language intervention experience. Consider Go-Togethers as one "go-to" intervention for your students with word retrieval difficulties (especially for its data-keeping functionality) and for those students who don't do so well on the CELF-4 Word Classes or Word Associations subtests. With 200 target items in 20 categories across two levels of difficulty, the app offers SLPs and other educators (and parents!) a LOT of content to work with. For a full video demonstration, see below! Go-Togethers Video Tutorial from Sean Sweeney on Vimeo. I hope you enjoy Go-Togethers. It was a lot of fun to work on this app! Disclosure: Author has a contractual relationship with Smarty Ears Apps and receives a portion of the profit of the sales of this app. Wow Sean, thanks for the GREAT post!! Looks like a very useful app. I too love working on semantic networking abilities! Thanks alot for the post. This really is helpful.